I returned from the above adventures and busied myself with a Day Skipper theory course at Plas Menai, National Sailing Centre that was then down the road from me in North Wales. With that under my belt, I bought a boat with the assistance of guru Jerome Poncet and set sail with his son Dion and friends Guillaume and Sarah Pern (of Ecoventures) across the Atlantic heading south. We arrived back in the Falkland Islands to celebrate Christmas in Stanley and the Millennium on Beaver Island. I then saw maybe 10 yachts for the next year skippered and crewed by a host of ginormous characters, larger than life, totally bonkers and mind blowing… the ones the books are written about (or should be), the sung and unsung heroes of the high latitude sailing world dealing tales of whales and daring do, bergs and close shaves in vast waves …on remote shores. I cut my teeth on several hair-raising adventures of my own, singed a few fingers and headed to Southampton to learn how to sail in the heaving Solent seas of a million yachts. Five on a boat for the Yachtmaster course and they taught me how to avoid the other nine hundred and ninety-nine thousand yachts, cook rice the never-to-fail Singapore way, and use the sails to manoeuvre in tight tidal spaces. I learnt so much that no amount of tall tales can teach you… and it translated effectively across the waters and latitudes back to the southern oceans. I spent the following 18 years sailing on my boats Ada and then Selkie. I showed folk the ropes that I knew (rather the lines). 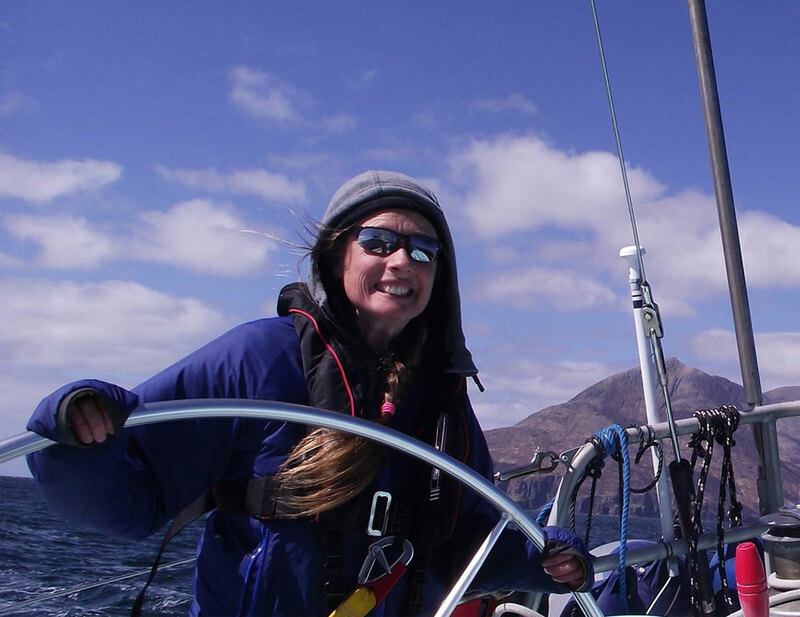 I started a charter company on the west coast of Scotland, Selkie Explorers, and for the past three years have taken out paying guests… and every time I am teaching folk how to sail Selkie: from school kids, artists and scientists stepping for the first time on to a yacht to Fastnet solo racers and ocean voyagers with far more knowledge and skill than me. All of which made me think it was about time to return to school and learn what others could teach me, advance my skill set and do some professional development. I enrolled on a RYA Cruising Instructor course with Celtic Sailing down in Deganwy, North Wales. I timetabled the pre-course tests into the diary and apart from actually doing them, I shelved the course… and looked forward to it …almost as if it would be a holiday from the day to day responsibilities of running the business, the croft, working through the winter boat maintenance list and being there and engaged with my awesome boy. WHAT PLANET WAS I FROM ….?!!! I almost walked so many times. On several occasions I barely made it to the marina ladies before collapsing into a howling, tear strewn heap of hopelessness and confidence stripped humanity. The final “almost walk” was onto a floating pontoon island in the middle of the Conwy River with a 5 knot current ebbing by. Things were not looking good. I felt I was having my fair share of First World problems. Luckily there was Brexit to give some light relief. My fellow students were skilled at counselling, organizing and entertaining. Their strengths were palpable, yet we were all challenged by the course (though I never saw any of them reacting quite so dramatically as me). My theory was very rusty, not something that I could roll off the tongue verbatim. I have resources on my boat that I use to check that I am correct in what I am seeing, especially as I often don’t have anyone else to ask. I am a great one for check lists, though you wouldn’t have known that last week. It was not my finest 100 hours as I untangled bad habits, waded through spreadsheets and theories and kicked myself for not finding time to brush up on… well most things! Our instructor, Richard, at one point remarked that I was never on the same page and I take that more as I was never on the same planet mate! Yes, I let myself down by not being prepared enough. However, I did learn an awful lot, which was the point of the exercise. I learnt my weaknesses, and my strengths, and I learnt that I could stay the distance, that I could swallow the bitter pill of not being good at something I thought I was good at. What I am good at is plying the waters around Eigg out to St Kilda and sometimes north. I am safe and I have been successful if the yard stick is happy punters. But something made me want to progress and push myself; to deliver more to the people joining me on Selkie. I have found it challenging to tow the line after a lifetime of dream chasing but that it what is necessary to be able to deliver the RYA courses. I need to be able to answer, unflinchingly and with confidence, any nautical mark and theory question posed to me. I need to be able to explain, deliver and give effective feedback to my students, my clients, my crew in such a way that when they are on another boat, with another skipper, or skipper themselves, they are on the same page… so the course was a bit like re-entering the atmosphere of the planet most people are from. It was a bumpy ride, heated at times, but in hindsight enjoyable. Big thank yous I offer to my instructor and fellow students – your personalities, words of wisdom and joviality all cheered me and kept me true to the course… and thank goodness for the night nav from Beaumaris to Deganwy – what fun!